While I’m caught up in the spirit of Legends, let’s look at some more of 2011’s projects I got too sad and grump to carry on with back then. 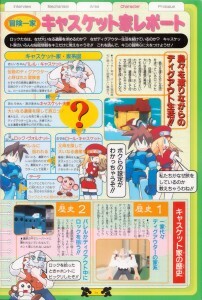 Presenting pages 24 and 25 of the Rockman Dash Daibouken Guide! Full pages and translation ahead! A Lineage of Adventurers: The Caskett Family Report!! Why do Rock (MegaMan) and his companions seek out the Great Legacy (Mother Lode)? Why do they continue to make their living as Dig-outers (Diggers)? With this tell-all made just for you, we’ll be prying into the private matters relating to the Caskett family!! By reading it, you may just light a fire in your own adventurous heart of steel (the game’s subtitle)! Roll: You’ll find out the reasons why we travel like we do!! Rock: You can learn all about us!! A Dig-outer’s life, full of island-hopping adventures!! Rock and his companions live out their lives traveling from island to island! Their goal is to discover the Great Legacy treasure! But they aren’t seeking the treasure to get rich. Their true objective is to discover the whereabouts of the Caskett couple (Roll’s parents) who went missing while searching for the Legacy. Caption: The Flutter is the trusty airship used by Barrell back in his adventuring days, its distinctive fuselage attests to its historic lineage. An adventurer who’s been called a legendary Dig-outer. Having managed to slip through countless perilous ruins, he’s earned the reputation of a legendary Dig-outer. He’s come out of retirement for the sake of Roll. Embarked on a quest for the Great Legacy! Growing up idolizing his famous father, Barrell’s son followed in his footsteps and also became a Dig-outer. This married digging duo went out in search of the Great Legacy and disappeared. She seeks the Great Legacy in order to find her lost parents!! She has grown into a gifted mechanic with an impressive affinity for machines. She supports Rock as he traverses the ancient ruins. A foundling taken in by Barrell. Found abandoned in the ruins by Barrell when he was just a small child, Rock has grown into a courageous Dig-outer. A monkey robot found alongside Rock. This mysterious monkey was found at Rock’s side and also taken in by Barrell. Seems he’s a real fan of the ladies!! A family made of several generations of Dig-outers. In his younger days, Barrell made it though a multitude of dangerous ruins and has become considered by many to be a “living legend.” Growing up wanting to be just like his dad, Barrell’s son sought to become a Dig-outer too. Caption: As a young man, Barrell was an intrepid adventurer just like Rock! Barrell comes across Rock in the middle of a Dig! While investigating a ruin, Barrell made an unbelievable discovery. There was a healthy boisterous baby, completely unharmed by the Lee-birds (Reaverbots). Caption: Right in the middle of the ruins, and not a single Lee-bird attacked him — how can it be!? Barrell: Back when I found Rock like that, I was absolutely astonished!! The Caskett couple disappears while out seeking the Great Legacy!! Barrell’s son grew up and got married, and Barrell’s granddaugher Roll was born. Not long after that the couple went out on a journey in search of the Great Legacy, but now their whereabouts are completely unknown. Caption: Any time you’re on a Digout in the ruins, danger is always lurking closeby. Rock: Roll, we should go looking for the Mister and Missus! Chasing rumors of the Great Legacy, they set out on a journey to find the parents! Barrell named the baby he found Rock, and raised him alongside his granddaughter Roll. In hopes of tracking down clues on her missing parents, they embarked on their own quest after the Great Legacy!! Wherever the Great Legacy is, Roll’s parents must be nearby! 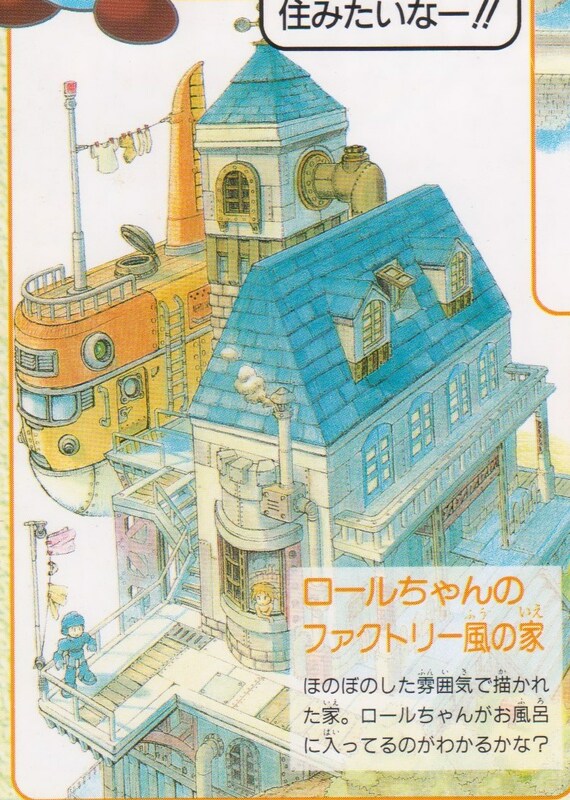 Rock’s house that exists only in these production drawings! In the early planning stages, Roll and Rock were going to live in a house! Presently Rock and crew live pretty much entirely on the Flutter, but aren’t these concept homes fantastic!? Data: Uki~!! I’d love to live in a house like these!! A residence modeled after the stately castles of antiquity. They imagined that the Flutter would dock on the mooring between the windmill and the main house. Another charmingly depicted household. Did you spot that Roll is taking a bath over there? In the game, the Flutter is their house!! Rock’s livelihood is completely tied to it, so the Flutter is really what he calls home. All their rooms are on board, and there’s even a living room to explore. 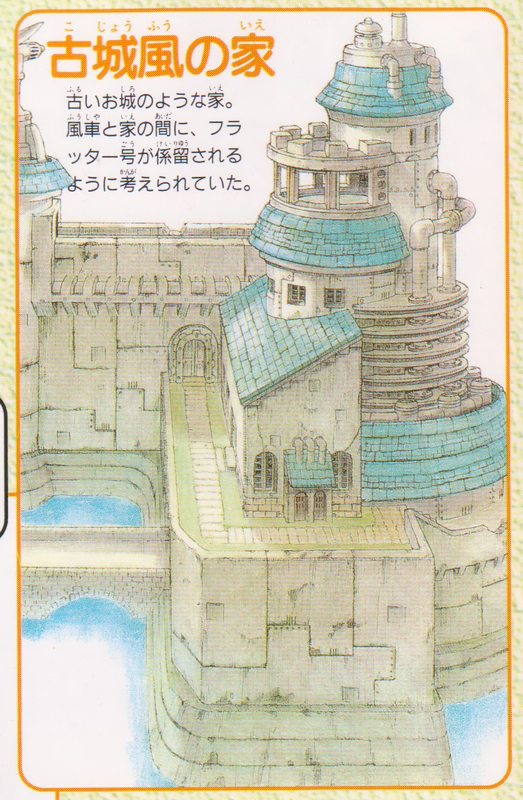 But that’s not all, it seems they drew up even more rooms in the production materials! See page 72 to check it out. Even the interior was completely designed!! Caption: Make sure you explore the interior of the Flutter as well! Perhaps you’ll make a few interesting new discoveries there. Now for the analysis! I decided to use the Japanese names and make my English name clarification notes in yellow. If anyone wants to know, my take on the “Friends?” and “Pet?” question marks, it’s denoting that Rock and Roll are probably more than just friends, and that Data is certainly more than just a pet. Page 72 will have to wait for another day. 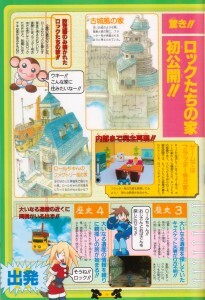 You might have already seen these Caskett house images a while back on the Mega Man Network. Oh well, look at ’em again! I can appreciate the castle on the sea, and it would be fitting for a world famous digger like Barrell to have a rather impressive estate. I like the more humble feel of the factory house, with little details like the laundry drying on the pole. Feels a bit warmer and more family-oriented in tone. But on the other hand it seems like Barrell was never quite as into cashing in on his fame as his pal Werner Von Bluecher was, so him selling his place and spending most of his savings on raising two kids and buying them the best digging equipment zenny can buy also makes sense. First is that in this outline we are told that Barrell’s son is Roll’s father, while in Legends 2 we find instead that Roll’s mother was Barrell’s daughter. This change introduced a somewhat unusual convention, that Roll’s father took his wife’s family name when he got married, but it’s not as though such things are completely unheard of in our world and could possibly be more normal in theirs. If we completely reassign the information given here onto Matilda about Barrell’s child growing up idolizing him and following his footsteps, it’s easy to think she was likely very proud of her father’s name would want to keep it. Banner might not have had too hard of a time wanting to get in on that famous heritage, either. They could have both just happened to have the same last name already as well, by some grand coincidence. I’ve seen it suggested that Banner and Matilda could both be Barrell’s children… Probably not what the developers had in mind since the second game Barrell refers to Banner his son-in-law, but I won’t judge your kinks if you don’t judge mine. 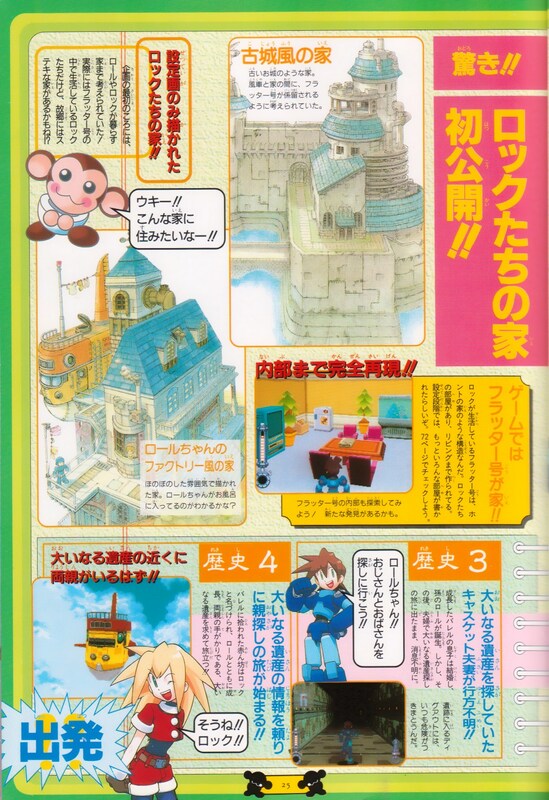 The second change is that in this book it states that they have no idea where Roll’s parents went off to when they left. They just completely disappeared, and so Roll has to chase down every lead and rumor about the Mother Lode she hears for clues on where her parents might have gone off to. In Legends 2 we find that Barrell and Roll both had a very good idea that her parents had gone off to Forbidden Island. Not only did Matilda state this in her letter to Barrell, but Roll even knew about the dropship plans Banner designed to land there safely, though she has been forbidden to build one herself. Since Barrell had once made it to Forbidden Island and then wound up awakening on another island, he might have thought the couple would have wound up on a different island as well. So perhaps they were out searching for people or places rumored to have some connection to the Mother Lode hoping they might turn up. Sure enough one of them did, and in the very town Barrell himself woke up on, so it’s really strange that he didn’t check all through Yosyonke years ago, or if he did that he somehow missed hearing about the amnesiac man who mysteriously washed up on shore around the same time his daughter and son-in-law disappeared. Meanwhile by some divine intervention Roll runs into him within hours of arriving on the island. But honestly, I don’t think Barrell believed they were really out there at all. In his private moments he seems to have accepted their deaths and was completely shocked to see Matilda alive at the beginning of Legends 2. So why pretend? In his journal Barrell writes that searching for her parents is all that is keeping Roll going. Her desire to seek out her parents keeps her from giving in to depression. 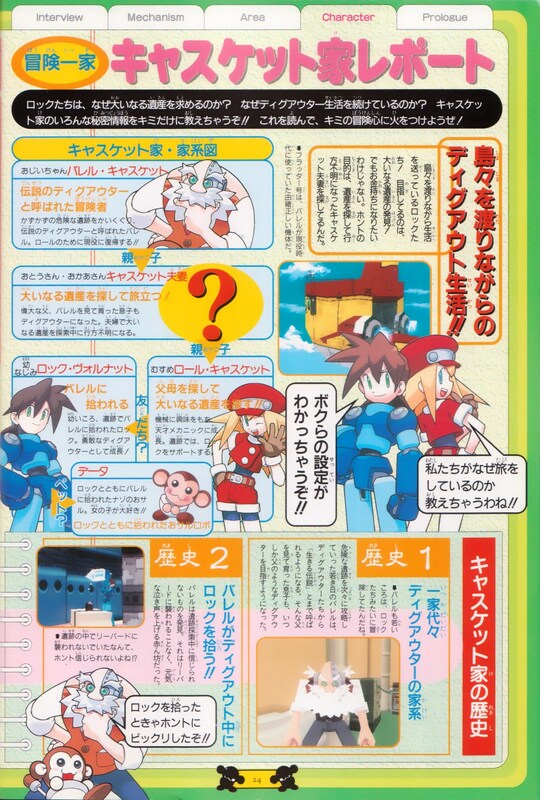 It motivates MegaMan and Roll to dig even more than the idea of a fantastical treasure, allowing Barrell to teach them a trade that will enable them to provide for themselves long after he’s gone. So perhaps Barrell is indulging this childish fantasy of finding her parents someday just to maintain everyone’s spirits, although he may also be training them to become skillful diggers and be prepared enough to one day tackle the mysteries of Forbidden Island themselves if they so choose. In which case, that also happened much earlier than Barrell expected. 1 Comment to "Meet the Casketts!" Thanks again for another great translation.